Despite the ingredients having strong flavours, I found that this tea tastes better if you’re generous with the leaves; a heaping teaspoon for a single cup. Let it steep for 3 – 5 minutes. This year, I had Christmas breakfast at my house, and served Harvest Spice after we had finished the meal. Due to the recognizable flavours, I wouldn’t say that it’s a great tea to pair with anything that has a lot of taste to it. It would be good with something simple, like a tea biscuit, but probably not too great with cookies or sweets. 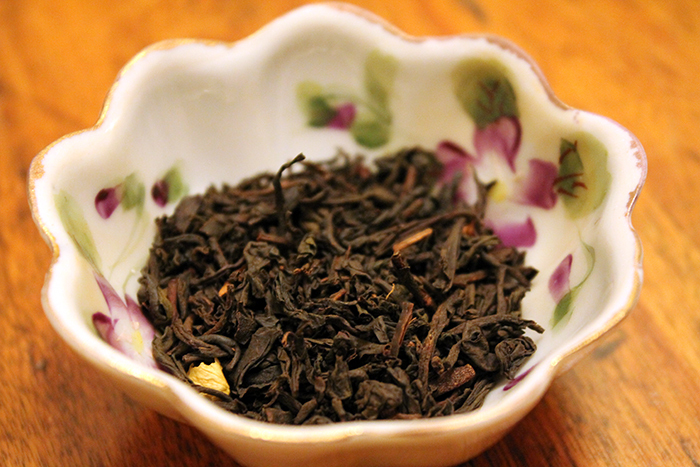 I usually take my black tea with cream and sugar, but I don’t find that anything is needed with this blend, which makes it really easy to serve. My father likes to put a bit of dairy in it to give it a bit more of a creamy flavour. A great tea if you’re looking to warm yourself up on a cold winter’s day, or if you just want to experience some good old Christmas spirit.